The Los Angeles Fire Department had to resort to releasing a statement to reassure witnesses. The statement mentioned that the ‘mysterious light in the sky is reported to be the result of Air Force Base launching rocket to put satellite into space’. 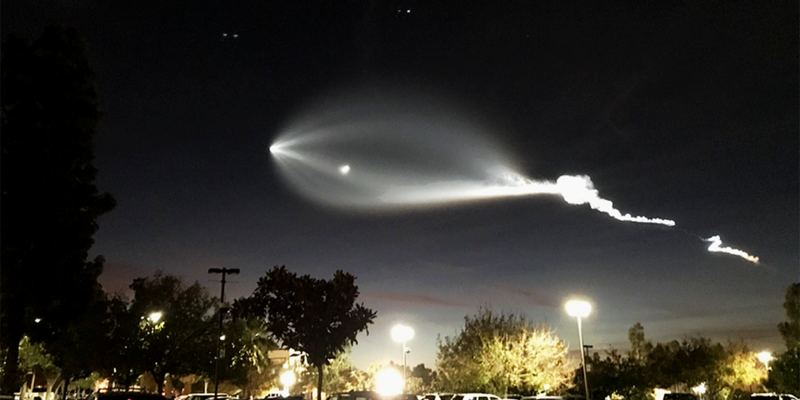 Elon Musk took a more light-hearted approach and tweeted, ‘Nuclear alien UFO from North Korea’, followed by a video of the impressive trail left in the sky because of Falcon 9. It is thought that the trail seen was due to the fact that the sun had barely set and was illuminating the exhaust gases that were being ejected out of the rocket as it soared through the sky. Space rockets like the Falcon 9 work by using Newton’s Laws of Motion. Put simply, rockets are chambers with gas that is under high pressure. When this gas is allowed to come out, it provides a thrust and allows the rocket to move in a direction opposite to the direction of the escaping gas. In order for the rocket to be launched into space, this thrust must be greater than the weight of the rocket. When this happens, there is a net force upwards on the rocket which causes the rocket to move upwards away from the ground. Unlike airplanes, the thrust of a water actually increases the higher it goes, this is because there is less air to slow down the rocket. Once the rocket is in the vacuum of space there is negligible resistance and there isn’t much need for a large thrust. The Falcon 9 is a two-stage rocket with nine first-stage engines and aluminum-lithium alloy tanks which contain liquid oxygen and kerosene propellant. The burn time of this stage is about 162 seconds. After this, the second stage is initiated which consists of a single engine and has a burn time of 397 seconds. SpaceX is hoping to make four more launches to complete the mission by mid-2018. In addition to this, Falcon 9 was designed to deliver humans into space and in collaboration with NASA they hope to achieve this. There's lots on the horizon for Falcon 9, watch this space. Source: Berboucha, Meriame. (2017, December 24). “SpaceX's Falcon 9 Launch Causes #Aliens To Trend”. Forbes.